funky tents launch NHS staff discount. In conjunction with healthstaffdiscount.co.uk we’ve just launched a discount scheme for NHS staff. You can view the details by clicking the button below. We respect and admire the work NHS staff do and wanted to help them Party as hard as they Work! If you have any NHS staff in your friendship group or family why not do them a favour and let them know? A Product wrapped in a Service. I’m often told that our quote isn’t the cheapest and asked if we can match the price of a competitor. This happened again yesterday and I came up with the following analogy to explain why this isn’t as straightforward as it seems. I do most of my grocery shopping at Lidl, I love it. I've been eating food for 53 years and cooking it for almost 40, I know what ingredients I need, understand the differences in quality, appreciate the varieties on offer and know what price to pay. I want to get in and out quickly. Lidl suits me perfectly. If I only ever prepared a meal every 5 years I would go to Waitrose. I'd want to see fruit & veg laid out in front of me in a visually appealing way, I'd talk to the Butcher about what meat best suited my dish, I'd use the little wine brochure to find the best match for my meal, I'd taste the cheeses and buy a familiar and posh brand of biscuit. It's a special occasion, I might even take the free newspaper and get my bags carried to the car! Waitrose would suit me perfectly. 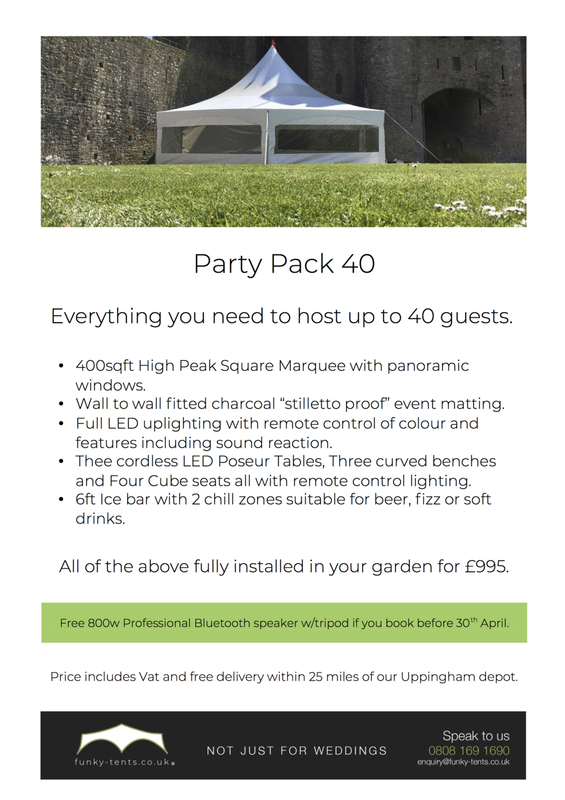 Because most people don't hire a marquee every month I spend a lot of time discussion options, offering solutions and helping them create the best possible venue for their individual event. For reassurance, security and just a little prestige we then deliver our service with branded vehicles and fully trained uniformed staff. Such levels of service and delivery cost money, just ask Waitrose. I can genuinely confirm that since starting to write this post the customer in question has confirmed that they are not only Lidl fans but completely understand the difference and will be booking with funky tents! We’ve just been awarded a Certificate of Excellence by the team at Bark. There a nice little badge on our website to say so… see if you can find it! "Spooks and Sparklers" - Halloween and Guy Fawkes get funky.